By Rose Carroll, from Edith Maxwell's Quaker Midwife Mysteries. The burden poor Charity had to bear proved too much for her. My author has written the tale, and following is the opening to the Charity's Burden, which will be published on the eighth day of Fourth Month (what you might call April). She'd like to give away a signed copy, too! I silently prayed she wasn’t. I stroked her hair back off her damp brow. “Of course not. But I need to have a doctor see thee.” I am a skilled and experienced midwife, but this was too much bleeding for an early-term miscarriage. I opened a drawer, looking for more cloths. A pamphlet printed on red paper lay half buried in a stack of neatly folded linens. I glanced around the threadbare bedroom where a note from my client had summoned me this frigid Second Month morning. “Does thee have a telephone?” I was certain she didn’t. My modest home a mile away had acquired one of the new devices only a month ago. The money? What money? Maybe she meant her husband’s next pay from the boat shop, but surely that would go first to food, clothing for the children, and paying off debts. He had been working for Lowell’s a scant few months. “I am sure he loves thee very much.” I hadn’t seen him be publicly sweet with her, but one never knew what went on behind closed doors in the life of a married couple. 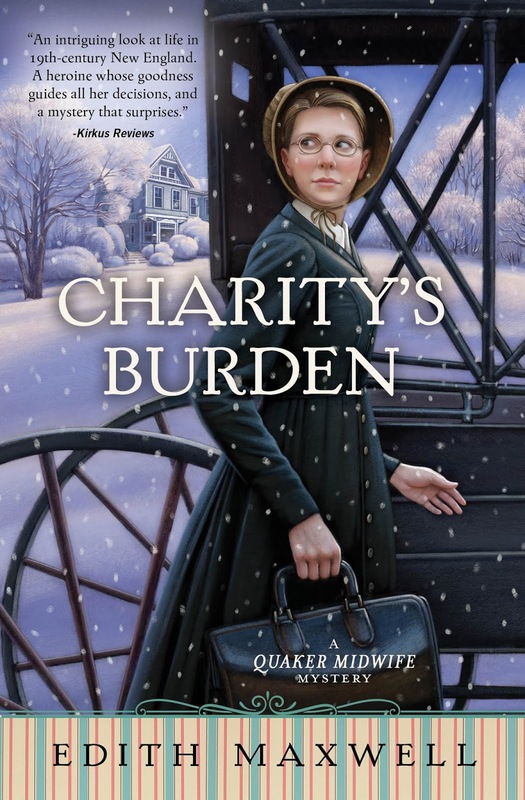 Readers, what burden - small or large - have you been able to overcome? Did someone help you? Edith will send a signed copy of the new book to one winner, so please include your email address. Maxwell lives north of Boston with her beau and two cats, and blogs here and with the other Wicked Authors. You can find her on Facebook, twitter, Instagram, and at her web site, edithmaxwell.com. I have many burdens but the greatest is lack of self esteem. People have tried to help but I still struggle. Debby, random.org chose you! Please check your email Congratulations! My greatest burden is being diagnosed with congestive heart failure at the age of 43. I have a hereditary weak heart & did not know it- had I not been Vegetarian for 32 years then Vegan, the doctor said I wouldn't have made it to the age of 30. Each child I had weakened my heart further (I now have 8)- we attributed the symptoms to my Hashimoto's disease. I have maintained being Vegan & am on medication to help strengthen my heart. Midwifery at its best (healthy mother and child) is wonderful. But not all deliveries are so lucky. My greatest challenge was going through a two year divorce. Thankfully I had the help of my faith and the support of my family and friends. During that time I found out how strong I am and that I can really take care of myself. My burden doesn't seem that bad compared to those commenting before me. Due to family genetics I am a type 2 diabetic and am always craving the sweets I'm limited to eat. I also had a heart attack in my 40s and deal with heart issues to this day. Thanks for the chance. My life has had it's ups and downs. The downs were certainly a burden. Random.org chose Debby! Number one out of fifteen - that's truly random. Congrats, Debby. Please check your email. I wish I had a copy for everyone. Thank you all for sharing your heartfelt burdens. My goodness, people have been through a lot. I wish you all the best, and am glad I can write books to help you escape some of your burdens. Sending hugs.